Seeds are the bearers of life. They are the rich sources of nutrients and provide the very basis of a wholesome, natural plant-based diet. Interestingly, seeds are often called powerhouses. They offer numerous benefits. They are allergy-safe, low in fat, high in protein, and extremely versatile when it comes to everyday usage. Most people can also digest seeds much more easily than nuts because they are smaller, and the body seems to handle them very well. They are dark and round with a silvery glow. These can be found whole or ground. Nutritional benefit: They are rich source of omega-3 fatty acids and are great for digestion, providing relief of constipation, reducing nervousness, treating insomnia, and improving mental focus. Chia seeds are rich source of protein. They are gluten free and very low in carbohydrates. Regular use results in weight loss. They are rich source of nutrients like magnesium calcium and phosphorus. Moreover, they also don’t need to be ground in order to obtain all their beneficial oils and fiber. Chia seeds reduce inflammation and control blood sugar levels too. They should be soaked in water overnight for consumption. They can be eaten raw, soaked in juice, added to porridge, pudding, smoothies or added to baked goods. Flax seeds are slightly larger than sesame seeds and have a hard, smooth and shiny shell. Their color ranges from deep amber to reddish-brown depending upon whether the flax is of golden or brown variety. While whole flaxseeds feature a soft crunch, the nutrients in ground seeds are more easily absorbed. Nutritional benefit: Flax seeds promote heart health and are associated with lower risk of heart disease. They are also a good source of fiber and help to lower cholesterol. Rich in fiber and heart-healthy omega-3 alpha linolenic acid, flax seed (also called linseed) is one of the best sources of antioxidant plant lignans. There’s little difference between golden and brown varieties of flax and both can be ground just to enhance absorption. Flaxseed shells are hard, so grind them in a blender or coffee grinder first. Otherwise the seeds can pass through your body undigested, prohibiting the absorption of the seeds’ valuable omega-3 content. Add the coarse or finely ground super seeds to smoothies, shakes, yogurt, oatmeal, cereal, casseroles, and when baking. One tablespoon of whole flaxseed contains as much fiber as half a cup of cooked oat bran. Consume 1 tablespoon of grounded flaxseed two to three times a day. Small, flat seeds that come from a pumpkin. They have a slight crunch, interesting green colour, and nutty flavour. Pumpkin seeds are best purchased raw, unroasted and unsalted. In the winter months, low toasting increases their flavour and digestibility. Otherwise, use them raw on salads and in soups, or blend them into salad dressings and smoothies. Pumpkin seeds are an excellent source of monounsaturated fats, magnesium and phosphorous, and are also good sources of iron and zinc. Plus, they have more than 8 grams of protein per ounce. Sesame seeds are tiny, flat oval seeds with a nutty taste and a delicate, almost invisible crunch. Nutritional benefit: Sesame seeds have highly active antioxidants that help to protect the liver from oxidative damage. They may act to reduce cholesterol and are also one of the best sources of calcium among plant-based foods. Tiny, flat, yellowish-green seeds with a soft texture and nutty taste. Nutritional benefit: Hemp seeds are a complete protein source as well as being extremely high in essential fatty acids and calcium. They contain over twenty trace minerals and are a great source of fiber and vitamin E while also containing chlorophyll. Rich in alpha-linolenic acid (ALA), which comes from high levels of Omega-3 fatty acids present in the seeds. These acids help in boosting the fat burning metabolism in the body. It is also full of fiber, so keeps your stomach satisfied for longer and prevents unwanted cravings. It helps in weight loss. It is a good coolant and reduces body heat. Prevents constipation and bloating. Rich in vit K and protein hence its good for skin and hair. Can consume 2 to 3 teaspoon in a day by soaking in water. A popular superfood, with lots of health benefits like being rich in protein and antioxidants. One of the reasons why it is a better alternative to white rice is its low glycemic index, meaning that it will not spike your blood sugar level quickly to stimulate hunger and contribute to weight gain. The versatility of quinoa also makes it easy to incorporate into your diet. It is gluten free, high in proteins and one of very few seeds containing all nine essential amino acids. Its rich in minerals, high in fiber and contains various antioxidants. 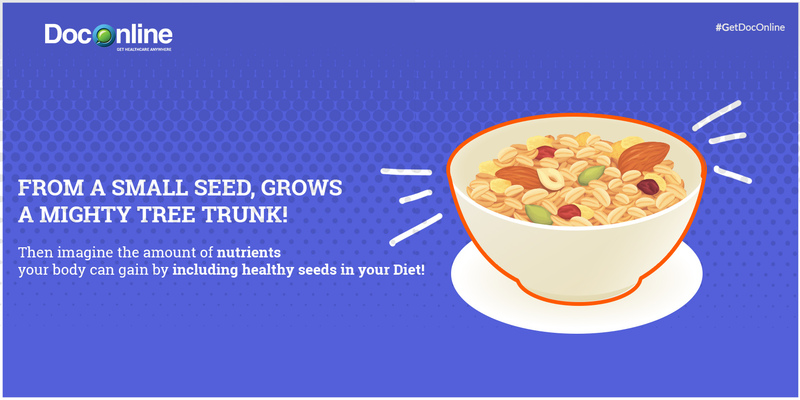 So, now that you are aware about the healthy benefits of seeds, you can include them in your diet and make your meals nutritious, thus leading an even more fulfilling and meaningful life!